Donkeys are foraging herbivores just like horses. In nature donkeys met their nutritional needs by roaming to find plants, licking on mineral deposits and other plant material and consuming fresh, clean water free choice. We now confine donkeys to stalls, dry lot paddocks or pastures. Donkeys (and ponies) are prone to founder more readily than horses. Be sure to check with your veterinarian before feeding any grain/ molasses feeds. Feeding of grain products is strongly discouraged. Many people believe that animals know what their bodies need. In nature they would find it. Donkeys kept in stalls and dry lot paddocks certainly can’t roam to meet their nutritional needs. Donkeys that are kept on pasture are still confined to some degree and can’t roam very far to find various plants and mineral. 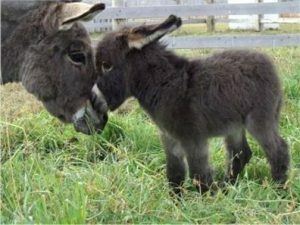 We offer products that support free choice feeding for your donkey’s unique living situation. Click on any product link below for even more info about the nutritious feed. EquiLix is an all-natural, non-molasses, non-starch free-choice lick tub. It contains vitamins, minerals, yeast, live enzymes, pre-biotics, and diatomaceous earth. It comes in 50lb, 125lb a 250lb sizes. EquiLix PI is intended for owners seeking higher product intake for horses, donkeys and mules working, in competition or for picky eaters that do not consume the standard EquiLix at the necessary rate to provide nutritional benefits. Redmond Naturals offers sea salt in two free-choice versions: Redmond Rock (7 lbs) or a Redmond 44lb Lick Block version. The Redmond Lick block comes in 8 types. EquiPride is the loose bagged version of the EquiLix tubs. It is a non-molasses, non-starch, vitamin, mineral, yeast, live enzymes, and pre-biotics. EquiPride can be ordered with diatomaceous earth and comes in a 25lb pail or a 50lb bag. This product is fed at 1 oz/100lbs. Redmond Naturals are sea salt and a volcanic ash (toxin binder) conditioner. Salt comes in lick blocks, rocks or crushed in bags. The conditioner comes in a 50lb bag. Mountain Sunrise makes all natural (no additives/binders) hay pellets in alfalfa, various types of grass hay (Bermuda, Bermuda plus, oat, and timothy) and a combination of alfalfa/Bermuda, alfalfa/oat and alfalfa/timothy. We offer 8 kinds of hay for you to choose from in 50lb bags. We also carry the Mountain Sunrise 80/20 pellets that contain 80% alfalfa & 20% corn, also in 50lb bags. We offer Beet-E-Bites’ all natural, low sugar, low carb hand-fed treats and the bran-free SafeMash. The treats come in carrot, apple, peppermint and licorice in 12 oz or 3 lbs. The SafeMash comes in an 16 oz package in apple or peppermint flavors.